Galerie Louise Manteau, Brussels (acquired from the artist). Private collection (acquired from the above, 1927). Private collection, Uccle, Belgium (by descent from the above); sale, Christie's, New York, 1 May 1996, lot 214. Paris, Galerie Bernheim-Jeune; Brussels, Galerie La Centaure and Berlin, Galerie Flechtheim, La Fontaine par Chagall, February 1930, no. 16. In December 1924, shortly before leaving for New York, the young Pierre Matisse arranged for Marc Chagall's first solo exhibition in France at the Galerie Barbazanges-Hodebert. In 1927, the notable art critic Maurice Raynal included Chagall in his laudatory monograph, Modern French Painters. Despite this favor and recognition from his adopted country, Chagall still found himself caught between his Russian past and French present. His contemporary projects for dealer Ambroise Vollard reflect this "identity crisis"--his first illustrations in 1925 were for countryman Nikolai Gogol's novel Dead Souls, his next, in 1926, for Frenchman Jean de La Fontaine's classic 17th century Fables. The latter commission, however, was not without controversy. Nativist critics objected to the "Russian" painter interpreting the beloved French text and compelled Vollard to defend the choice in an article in L'Intransigeant: "'Why Chagall?' my answer is, 'Simply because his aesthetic seems to me in a certain sense akin to La Fontaine's, at once sound and delicate, realistic and fantastic'" (quoted in F. Meyer, Marc Chagall, Life and Work, 1963, New York, p. 348). Buoyed by Vollard's unwavering support and his success of the mid-1920s, Chagall boldly undertook the series. The present work was among these lively, vibrant illustrations: "the burst into colour for Fables after the black and white of Dead Souls was expressive of the joy, exploration of nature, and stability in his life" (J. Wullschlager, Chagall, A Biography, New York, 2008, p. 327). Despite Vollard's efforts, the series--for which Chagall ultimately produced one hundred gouaches--was never published in its intended form. An edition of engravings after the colorful originals was released in 1952, but the gouache Fables remained largely unseen until the 1995 anniversary exhibition--the three hundredth year from La Fontaine's death and the tenth from Chagall's--at Céret. The present fable concerns the inheritance of three daughters of diverse habits: one was beautiful and lascivious, the second, frugal and partial to the country, and the third, unattractive and given to drink. Their father's will specified that they split his estate equally, on two conditions: that they not possess or enjoy what they would be given, and that they settle the substantial sum of 100,000 sesterces on their mother. Unsure how to fulfill this curious request, their mother gave the finery and jewels to the first daughter, an estate in the country to the second, and an elegant house with casks of vintage wine to the third. Before she was able to, however, Aesop emerged and solved the father's riddle: assign the portions contrary to taste and each will sell off and have the funds to bestow the specified sum on their mother. 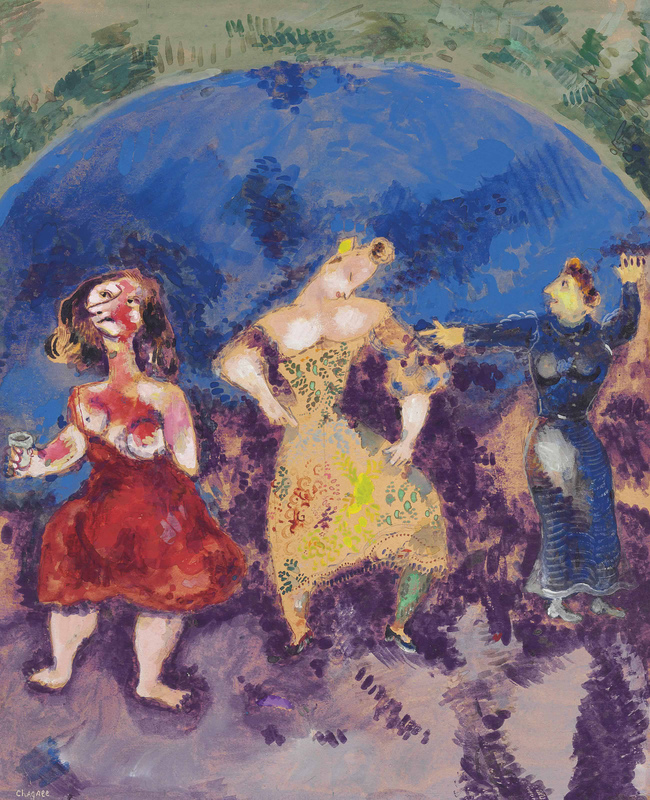 In his illustration, Chagall accentuates their differences, the bibulous, frivolous and austere daughters pictured from left to right. Few individuals have contributed so greatly to contemporary Jewish life as Edgar M. Bronfman. A visionary businessman and unyielding advocate for world Jewry, Mr. Bronfman translated his tremendous success at the Seagram Company into a decadeslong journey in philanthropy, dedicating himself to promoting a "Jewish renaissance" whose effects continue to be felt to this day. After he was elected president of the World Jewish Congress in 1981, Edgar M. Bronfman began a series of remarkable international campaigns for the security and prosperity of the Jewish people. Under his 26-year tenure, the WJC became the world's preeminent Jewish institution, recognized by world leaders as a formidable voice in diplomatic affairs. Of particular note was Mr. Bronfman's role in advocating for Jewish rights and well-being in the Soviet Union, and in 1985 he became the first WJC president to be formally received by the Kremlin. Convinced of the need to present a strong and unified Jewish voice, Mr. Bronfman earned a reputation amongst world leaders and diplomats as a resolute, tireless negotiator. Former U.S. Secretary of State Hillary Clinton hailed him "as a champion for justice and human dignity," adding that he "exuded a confidence and honesty that won him the friendship and support of presidents and popes and people everywhere." In 1982, Mr. Bronfman became the first representative of a Jewish organization to speak before the United Nations, and in the 1990s he spearheaded the WJC's campaign to recover Jewish property seized during the upheavals and aftermath of the Second World War. Mr. Bronfman continually expanded his efforts, serving as president of the World Jewish Restitution Organization and chairman of the United States Commission on Holocaust Era Assets. Behind Edgar M. Bronfman's international advocacy in the World Jewish Congress was his belief in Jewish culture, heritage, and values. He forever cherished the traditions at the heart of Judaism: learning, pluralism, debate, and enquiry--the essential components for the faiths continued relevance. As founder, president, and chairman of the Samuel Bronfman Foundation--named in honor of his father, a Canadian businessman and philanthropist--Mr. Bronfman focused on international engagement, bringing Jewish knowledge to people of all backgrounds. Mr. Bronfman was justly proud of his outreach to young Jews, particularly via Hillel: The Foundation for Jewish Campus Life, and the Bronfman Youth Fellowships. He revived Hillel in the 1990s, transforming it into the largest Jewish campus organization in the world, with chapters reaching beyond the United States to Russia, Eastern Europe, Israel, and South America. He founded the prestigious Bronfman Youth Fellowship program in 1987, challenging future Jewish thinkers, writers, and leaders from Israel and North America to deepen their understanding of Judaism and the importance of social responsibility. As his own life was enriched with serious intellectual study and hard work, so were the lives of young people enriched by Edgar M. Bronfman's tremendous generosity. Edgar M. Bronfman was the author of Hope, Not Fear, The Third Act, The Making of a Jew, Good Spirits, and the Bronfman Haggadah, illustrated by his wife, Jan Aronson. Internationally recognized for his prodigious giving and dedication, Mr. Bronfman was inducted into the French Legion of Honor; was awarded the Presidential Medal of Freedom by Bill Clinton, the Leo Baeck Medal, the Hillel Renaissance Award, and the Justice Louis D. Brandeis Award; and was bestowed honorary degrees from the University of Rochester, New York University, the Hebrew University of Jerusalem, Tulane University, Williams College, and Pace University. Michael Steinhardt of the Hillel Foundation called Mr. Bronfman "the great Jew of his era," while Dana Raucher, executive director of the Samuel Bronfman foundation, noted that Edgar showed how vision and long-term thinking can impact the entire landscape of Jewish life. In his absolute devotion to humanitarianism and the Judaic traditions that informed his life, Edgar M. Bronfman stands as an inspirational figure for people of all backgrounds--a testament to the power of belief in the modern world.